Project management guarantees clear project structures, competence and traceability of all essential and important decisions and changes as well as clarity in costs and time schedule in all phases of your projects from the beginning until taking the property in operation. The bigger the project, the more people are involved – and the more important it is to have a clear structure and documentation. Many experts, authorities, insurances, public funding offices and last but not least the departments of your company as well as the owner, management and board of directors are involved in constructing industrial and office buildings. All participants shall be connected successfully, and involved in the project according to their competence and expertise, to successfully and economically implement your building project. Schedule reporting – target-performance-comparison on the basis of the set time schedule and changes in the project itself or influenced by other factors like weather, tenants etc. 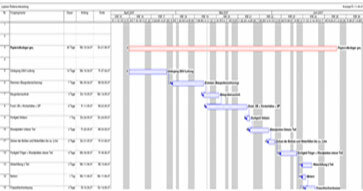 You have a clear structure and clear allocation of responsibility during the engineering and construction. Everything is traceable and all interfaces are clear.